Load em up and let it bang as the clock strikes 13. 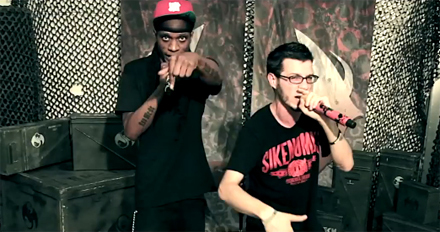 Direct from Strange Music HQ, Ubiquitous and Godemis of CES Cru fire off round after round of combustible flows with a live performance of “Klick Clack Bang” from the upcoming 13 EP. Moving as one, CES Cru demolishes the beat in flawlessly executed sequences that demonstrate the polished edge that first caught the attention of the general, Tech N9ne. From performing live to lighting up the booth, CES Cru once again lives up to the Snake and Bat standard. CLICK HERE TO PRE-ORDER 13. What did you think about “Klick Clack Bang”? Have you ever caught CES Cru live?